It's time for another Challenge and I was able to play along this week. I really like these colors together.. I'm hoping I can get some time to make another card before the Deadline.. 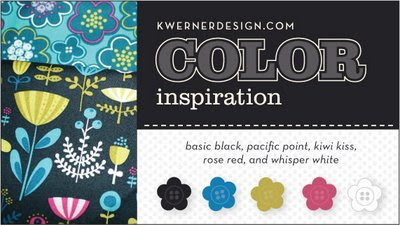 Here are the details: The set is from the Occasions Mini that started April 1st.. called "Great Friend"..Card Stock and Ink are Pacific Point, Kiwi Kiss, Rose Red, Basic Black and Whisper White. Polka Dot DSP is from "Bella Rose" I used the scalloped border punch on the Pacific Point piece and the Black Striped Ribbon is a stray piece that I had laying around from a Stampin' Up! Ribbon Originals a few catalogs back. Below is a detail shot of the Butterfly.. 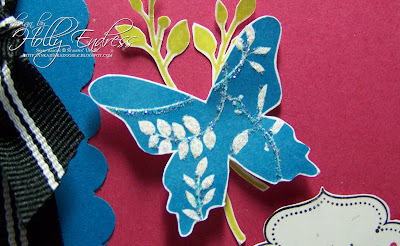 I used a Quickie Glue pen to add Dazzling Diamonds to the details of the Butterfly.. 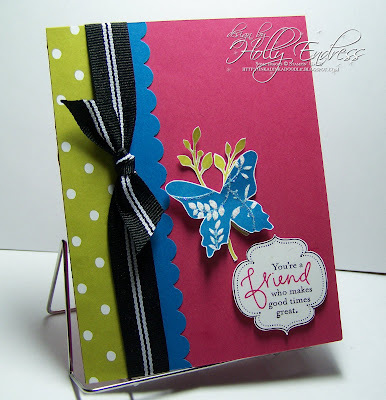 I love the Quickie Glue Pen, some of you have received one from Blog Candy or from entering Sunday Stamps. Isn't it a great little pen? I hope everyone is having a great start to the Easter Weekend..Hope there are lots of Chocolate Bunnies for you on Sunday. So pretty! Love that stamp set! Great job! Where have I been? That ribbon is lovely. Fabulous job with the color combo.